An HK417 used by PASKAL on display. The HK417 is similar in internal design to the HK416, although the receiver and working parts are enlarged to suit the larger 7.62×51mm cartridge. The bolt is a seven-lug rotating type, which sits in a bolt carrier and operates in a forged alloy receiver resembling those of the Stoner-designed AR-10, AR-15 and M16 rifles. Like the HK416, the HK417 is gas-operated with a short-stroke piston design similar to that of the Heckler & Koch G36. The short-stroke piston is more reliable than the original direct impingement operation of the AR-15 design because, unlike these weapons, it does not vent propellant gases directly into the receiver, which deposits carbon fouling onto the bolt mechanism as well as heating it up. The early HK417 prototype used 20-round magazines from the Heckler & Koch G3 rifle family, which did not feature a bolt hold-open device. Later prototypes, however, switched to a polymer magazine with bolt hold-open. The magazine resembles an enlarged version of the G36's transparent magazine, except without the pins for holding more than one magazine together. Purchasers of the HK417 have typically intended it to complement lighter assault rifles chambered for less powerful intermediate cartridges (often 5.56×45mm NATO), for the designated marksman role. The HK417's greater accuracy, effective range, and penetration offset its greater expense, its lower rate of fire, and its smaller ammunition capacity both in magazine and carriage. The HK417 A2 is the improved version. The design of the receiver, barrel interface, gas port and the bore axis alignment of the rifle have been further optimised to increase its accuracy and reliability. The German Army uses the HK417 A2 - 13″ with the designation G27. Accurized barrels provide 0.3 mil (1 moa) accuracy (with match grade ammunition). A barrel can be changed in under two minutes with simple tools. All HK417 barrels are cold hammer forged and chrome-lined and use a conventional lands and grooves bore profile with a twist rate of 1 turn in 279.4 mm (11.00 in). They are designed to function reliably with bullet weights ranging from 9.3 to 11.34 g (144 to 175 gr) and are threaded for a flash hider or sound suppressor. The civilian MR308 was used to develop the G28, a designated marksman rifle for the German Bundeswehr (Federal Army) deployment to the War in Afghanistan. The semi-automatic G28 is chambered for 7.62×51mm NATO and has a factory warrantied accuracy of 45 mm dispersion at 100 meters (0.45 mil or 1.5 moa) when fired with 10 rounds using OTM/HPBT/Sierra Match King ammunition. The G28 features STANAG 4694 NATO Accessory Rails that are backwards-compatible with the STANAG 2324/MIL-STD-1913 Picatinny rails. The upper receiver is made from steel instead of HK's aluminium alloy. Approximately 75% of the parts are interchangeable with the HK417. There are two different versions of the G28: G28 E2 (Standard) with a Schmidt & Bender 3–20×50 PM II (modified to Bundeswehr requirements) and the G28 E3 (Patrol) with Schmidt & Bender 1–8×24 PM II. By October 2017, Heckler & Koch had renamed the G28 as the HK241, though G28 remains its Bundeswehr designation. In April 2016 Heckler & Koch confirmed that a lighter version of the G28 had won the United States Army's Compact Semi-Automatic Sniper System contract to replace the M110 Semi-Automatic Sniper System. It is designated as the M110A1 and uses an aluminum upper receiver instead of steel to meet weight requirements, weighing 8.4 lb (3.8 kg) unloaded and reaching some 15 lb (6.8 kg) loaded and with accessories; the M110A1 features a Geissele M-LOK rail handguard, Schmidt & Bender 3–20×50 PM II Ultra Short telescopic sight, Geissele optic mount, OSS SRM6 suppressor, 6-9 Harris bipod and mount, and a collapsible stock with adjustable comb. In May 2018, the U.S. Marine Corps will begin receiving the CSASS, also to replace the M110. In March 2018, the Army announced that a version of the G28/M110A1 would be issued to infantry squads as the service's standard Squad Designated Marksman Rifle (SDMR). Issuing a 7.62×51mm NATO SDMR is meant to increase individual squads' ability to defeat enemy body armor that standard 5.56×45mm NATO rounds cannot penetrate. The M110A1-based rifle will replace the M14 EBR, in use by the Army since 2009, but because it was based on an operational needs statement it had to be turned in by units at the end of a combat deployment. Unlike the sniper configuration, the SDMR model will be equipped with a different buttstock and barrel twist than the CSASS model. The marksman version is fitted with a simpler SIG TANGO6 1-6×24 telescopic sight to make quick adjustments between 0–600 m (0–656 yd), and it fires M80A1 Enhanced Performance Rounds or XM1158 Advanced Armor Piercing Rounds rather than sniper rounds; it will be fielded with a suppressor to make the marksman less identifiable with louder 7.62×51mm NATO rounds. The SDMR TANGO6 1-6×24 telescopic sight features a red horseshoedot for fast aiming and an illuminated Extended Range Bullet Drop Compensation (BDC) illuminated front focal plane reticle. Roughly 6,000 are planned to be fielded with one per squad in infantry, engineer and scout formations starting in late 2018. The MR308 is a civilian variant of the HK417, introduced in 2007 alongside the MR223, a civilian HK416. It is a semi-automatic rifle with several "sporterized" features. At the 2009 SHOT Show, the two rifles were introduced to the American civilian market as the MR762 and MR556, respectively. Since then both were replaced by the improved MR762A1 and MR556A1. and the regular French army as a DMR, it is also used by various police units and the gendarmerie. A Croatian Army HK417 12″ 'Assaulter' model on display. From top to bottom: a .338 Lapua Magnum Sako TRG-42, .308 Winchester MR308, .223 Remington Schmeisser GmbH AR15 M5 and a 9 mm AR-15 on display at the 2012 ARMS & Hunting exhibition. Irish Army Ranger Wing airborne sniper team on a helicopter during the 30th anniversary of the ARW. A sniper from the Norwegian Home Guard's task force "Bjørn West" armed with an HK417 designated marksman rifle. 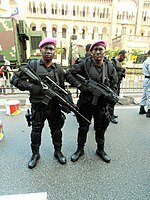 Royal Malaysian Navy PASKAL operators on standby during the 59th National Day Parade of Malaysia at Merdeka Square, Kuala Lumpur. One is armed with a 7.62mm HK417 Sniper Rifle. Unfortunately his Schmidt & Bender optic is installed backwards. ^ a b "HK417 A2 - Effective and versatile". Heckler & Koch. Retrieved November 15, 2014. ^ "Newer carbines outperform M4 in dust test". Army Times. December 17, 2007. Retrieved January 30, 2011. ^ a b c d e f g h i j k l m "Heckler & Koch HK 417 Battle Rifle / Sniper Rifle (2006)". Military Factory. June 22, 2014. Retrieved December 23, 2014. ^ a b "Entscheidung zur Zwischenlösung G36" (in German). Bundeswehr. August 27, 2015. Retrieved June 5, 2016. ^ "2008 Heckler & Koch Military and LE brochure" (PDF). Retrieved 2011-01-30. ^ "HK241 Technical Data". Heckler & Koch. Retrieved 15 November 2014. ^ "HK241 Product Overview". Heckler & Koch. Archived from the original on October 8, 2017. Retrieved November 15, 2014. ^ a b Jahner, Kyle (April 8, 2016). "H&K confirms: This is the Army's new and improved sniper rifle". Army Times. Retrieved June 9, 2016. The gun will replace the M110 made by Knight's Armament as a culmination of the Army's desire for a shorter, lighter rifle that didn't sacrifice accuracy or performance. ^ Nathaniel F. (January 18, 2017). "HK Shows Off the US Army's M110A1 CSASS Compact Sniper Rifle - SHOT 17". The Firearm Blog. ^ "SHOT Show 17 – H&K M110A1 CSASS". Soldier Systems Daily. January 23, 2017. ^ The Marines just switched their main sniper rifle ― look what’s next. Military Times. 9 April 2018. ^ Army Plans to Field H&K G28 as New Squad Marksman Rifle. Military.com/Kitup. 6 March 2018. ^ Army to Begin Fielding Thousands of Squad Marksman Rifles by Oct. 1. Military.com/Kitup. 23 March 2018. ^ Army to field Squad Designated Marksman Rifle in September. army.mil, 5 June 2018. ^ "Approving the MR223 and MR308 for civilian sale inside Germany". Archived from the original on June 6, 2008. Retrieved September 3, 2014. ^ "Heckler & Koch MR556 and MR762 brochure" (PDF). Archived from the original (PDF) on April 19, 2009. ^ "New HK Products for 2012". Heckler & Koch USA. Archived from the original on March 19, 2015. Retrieved September 3, 2014. ^ "HK-USA Rifles". Heckler & Koch USA. Retrieved September 3, 2014. ^ "Contract Notice View – CN352591". AusTender. Australian Government. December 14, 2010. Retrieved January 30, 2011. ^ Juchniewicz, Nathan (July 21, 2011). "New weapon to go the distance". Army News (Australia). Retrieved August 4, 2011. ^ a b "DefesaNet - Armas - PF - 200 novos fuzis de assalto HK 417 são distribuídos". DefesaNet. Retrieved 15 November 2014. ^ "Oficiální web 601. skupiny speciálních sil generála Moravce". www.601skss.cz. Retrieved 25 October 2017. ^ "Geværer" (in Danish). Retrieved 7 April 2015. ^ "FOTOD: Millega tegeleb eestlaste eriüksus Afganistanis?". delfi.ee. Retrieved 25 October 2017. ^ "HK 417- fusil d'assaut de la firme Heckler & Koch" (in French). French Land Army official website. Retrieved 2013-07-17. ^ "G28 marksman rifle technical data sheet specifications information description intelligence pictures". Army Recognition. October 22, 2011. Retrieved January 8, 2012. ^ "GSG9 German Special Police Weapons". Military Factory. February 18, 2016. Retrieved February 20, 2016. ^ Thompson, Leroy (1 March 2013). "Ireland's Army Rangers (page 1)". Tactical-Life. Retrieved 19 November 2016. ^ Abas, Marhalim (2010-04-23). "DSA 2010 Part III". Malaysian Defence. Retrieved 2011-08-01. ^ "SF Operator is a special profession". Dutch Defence Press (in Dutch). June 6, 2009. Retrieved January 30, 2011. ^ "KCT sniper teams using the Heckler & Koch 417". Dutch Defence Press (in Dutch). April 20, 2011. Retrieved June 13, 2011. ^ Kapten Trond Setså. "Sniper Course". Defense Net (in Norwegian). Norwegian Defense. Archived from the original on February 2, 2009. Retrieved January 30, 2011. ^ "Police Headquarters Official Gazette No. 13" (pdf) (in Polish). September 25, 2009. Retrieved January 30, 2011. ^ "YouTube". m.youtube.com. Retrieved 25 October 2017. ^ "Russian SPETSNAZ Weapons". Military Factory. February 20, 2016. Retrieved February 20, 2016. ^ "HK in Russia - Page 2". www.hkpro.com. Retrieved 25 October 2017. ^ "Specijalne-jedinice.com - Special Police Unit of the Republic of Slovenia". specijalne-jedinice.com. Retrieved 20 October 2018. ^ Harding, Thomas (June 26, 2009). "SAS parachuted in to Baghdad". The Telegraph. Retrieved January 30, 2011. ^ Middleton, Ashley (October 27, 2012). "Firearms unit". Flickr. Retrieved April 30, 2015. ^ "All sizes - Throckmorton". Flickr. Retrieved April 30, 2015. ^ "Navy SEALs Weapons". Military Factory. May 12, 2015. Retrieved May 5, 2015. Wikimedia Commons has media related to HK 417. Wikimedia Commons has media related to HK MR308.